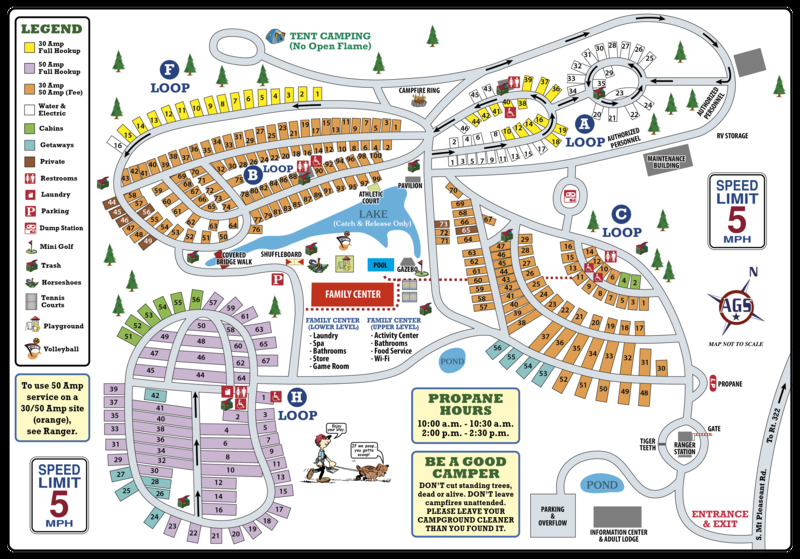 Ask fellow campers about "Hershey RV & Camping Resort" and nearby attractions. When we were at Hershey before we picked a site on the hill of Loop H. The 50 amp sites in that area don't have the $3 a day surcharge that is charged for all the other 50 amp sites in the campground. However, I must confess we got a bit tired of the big hill. For this stay we decided to check out Loop B. We found a great spot and felt we made an excellent choice. About all but the sites in Loop A (which has some very nice spots) are full hookup. Honestly, it isn't hard to find a nice campsite in this Thousand Trails. Every interaction we had with the staff was positive and we appreciated their helpfulness. My only complaint is the lack of internet connectivity. My Verizon signal was poor leaving me with only a fair data connect. Campground WiFi is only available at the Activity Center and it is even slower - think old time dial-up speeds. It isn't that the campground hasn't tried to supply WiFi. The area providers simply aren't willing to come out to the campground. My satellite TV signal was easy to dial in. 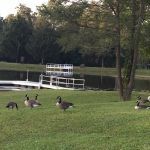 There are many interesting things to see and do in the area as well as a nice pool and other facilities right on the property. Lots of shopping and restaurants are within 30 minutes. 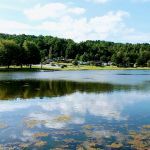 It is easy to see why Hershey Thousand Trails is one of the most popular campgrounds in the system. We are already thinking about our next visit. We camped at Hershey RV & Camping Resort in a Fifth Wheel. Hersey RV now Thousand Trails Campground. This is a time share type park. They will try to sell you memberships. $60p/n full hook up. Nice park, dated. Bathrooms 3 star. Good water pressure, must continually push button to get water, no fans, no air, gets hot and humid. There are exhaust fans but none work. All gravel roads and parking areas. Young lady showed us to spot, very nice. They warn on handouts about power loses and not to keep dogs in RV. We did lose power for several hours, went on generator (be prepared if your furbabies in RV). We were in 30' TT and had adequate space. Lots close together. Do not miss Strasburg Train ride and museum, well worth the 45 min drive. 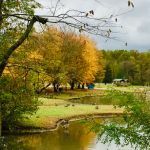 We camped at Hershey RV & Camping Resort in a Travel Trailer. This is a Thousand Trails campground. When we arrived we were told the free 50 amp sites were up on a hill, the other 30/50 amp sites cost $3/night. Because it was forecasted to rain the night we arrived, we chose to take a (free 50 amp) site at the top of the hill. We were surprised how level the site was given it was on a hill. The site was narrow and you were close to your neighbor, but able to put out your slide outs and awnings and it was nicely shaded. 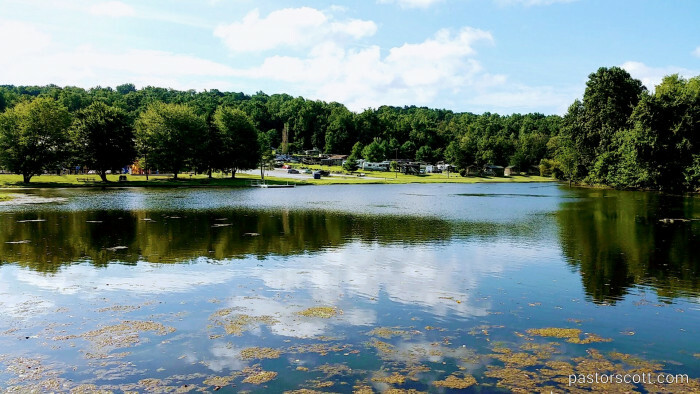 The campground has many amenities including a nice clean pool, tennis courts, shuffleboard, miniature golf, catch and release pond where you can also kayak if you bring your own, arcade, sauna room, camp store with prepared food available, billiards and ping pong tables. This is a large campground so unless you have a golf cart or have a site near the activities, you will most likely drive to them. Bathrooms, showers and laundry available all in one building and were kept clean. 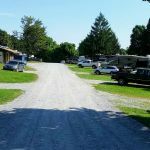 We camped at Hershey RV & Camping Resort in a Travel Trailer. 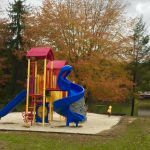 This campground is 20 minutes away from Hershey Park and Tanger Outlet stores. Lancaster is also nearby. This is a very nice Thousand Trails park and we really enjoyed our stay. We stayed in site 57 that was very spacious and had a great view of the lake. It also included full hookups and 50 amp for no additional fee. Check-in was quick and easy and the staff working at the front gate/booth were always friendly. The activity center is nice and the other amenities like the pool area looked nice as well but it was not open for the season yet. They allowed us to receive packages there which we really appreciated. Verizon, AT&T and T-Mobile all worked well. This is one of the nicest Thousand Trails parks we have been to. One piece of advice though if you are approaching the campground where you would need to turn left to enter the campground. There are no signs alerting you to the campground entrance and it sneaks up on you. Coming from the other direction where the campground would be on your right, there are many signs to help you out. 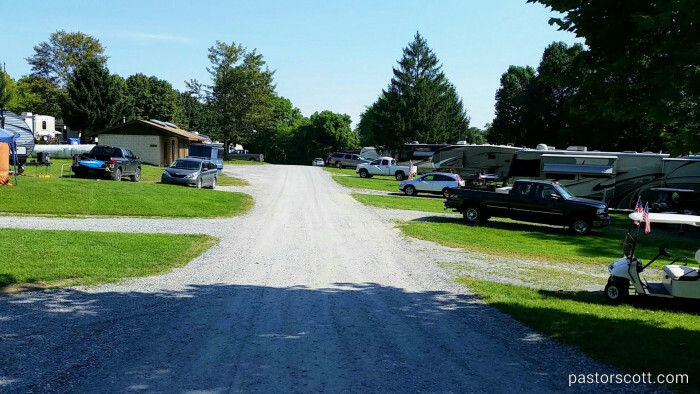 We camped at Hershey RV & Camping Resort in a Fifth Wheel. Since we fulltime RV I am always in search of places to have my hair cut and colored. I went to Salon Element in Lebanon and they were fantastic, highly recommend! The location is great for visiting Hershey attractions. Our experience was BAD! First off we came to a gated entrance no guard, no way to get in, no contact info! Called the resort number twice and no one answered! Finally a lady behind us gave us the code! Went to a building that said family building. The 3 ladies (I use that term loosely) told us we had to drive our RV and trailer back to the ranger station and check in! Also that we didn't have a reserved slot and we couldn't take our trailer with the Harley inside to our campsite! Finally the Ranger showed up and said he would allow us the courtesy to let us pick our spot and drop our trailer and he would bring us the paperwork! This was not at all told to us when we made the reservation! The fishing lake is loaded with moss and unfishable! The pool wasn't open, he shuffleboard court was non existent, basketball court not open and when we tried to use the spa at 7 Pm it was locked - supposed to be open till 10! Ranger told me he locked it because there was more bad weather coming! Told him there wasn't and we only wanted to use hot tub for a bit! He said He Was Not Unlocking It! These people are not friendly, helpful or courteous in any way! This is an Encore resort and the management should be informed of all this! Very unprofessional! Glad we were only staying 4 days! 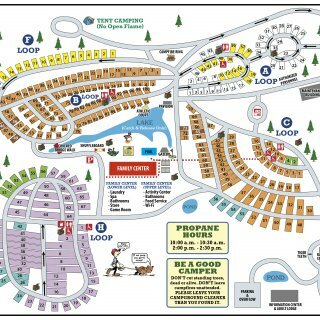 We camped at Hershey RV & Camping Resort in a Motorhome. My family and I have been at the Hershey campground several times. We have always enjoyed it and were very pleased, but we were very disappointed when we visited in May 2017, just a few weeks after the parked opened for the season. Many of the roads around the campground were not restoned and there were many holes throughout. Also, the bathhouse in the B loop was closed for renovation (which is great but why wasn't this done during the off season?). Also, the miniature gold course has a wonderful setting but needs improvement, as balls get stuck in some of the holes. 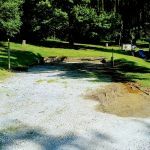 While the campground itself is beautiful, there is much work to be done. We camped at Hershey RV & Camping Resort in a Fifth Wheel. This is a well maintained, clean park. Spaces are level with gravel surface and extra wide separation between sites. Road width was adequate to maneuver my 43 foot motorhome, but required care while turning. We were in H area with no extra charge for 50 Amp, other 50 Amp areas have $5/day surcharge. Wifi was non-existent but AT&T hotspot worked fine. Satellite worked well. Would stay her again. We camped at Hershey RV & Camping Resort in a Motorhome. Very unusual set-up, for us anyway. We're not Thousand Trails members so it was a little confusing to pull up with our 39' 5th wheel and be told to go find a spot and come back and register. In 30 years of camping I've always gone to the office and been assigned a spot. This place was packed due to the Hershey camper show and we've never been to this park before. Fortunately a staff member was available and took us around in a golf cart, leaving our truck/trailer in a staging area. We found only 2 spots that we would fit in, I can't imagine driving around a strange park alone to find a spot. Is this the same of all Thousand Trails parks? Finally, a major cleanliness issue with the hot tub. We found hair balls and other unusual floaties in the tub. We reported this to the office, tried again next day and it was worse. 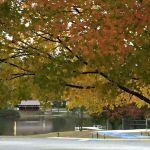 We camped at Hershey RV & Camping Resort in a Travel Trailer. In the middle of nowhere, 20 minutes to Hershey, 20 minutes to McDonald's or Walmart. Old campground, sites are first come first served, no guarantee that you will receive 50 amp site or sewer. Very steep interior roads and hills, very tight turns, drive over low curbs and corners. Do not arrive in the dark. Review Google Maps and campground map before arriving! H loop has 50 amp full hookups. Other loops supposedly have 50 amp, but there is an additional $3 per night post-arrival charge because they are newer than 10 years old. Some sites are level and some are incredibly too unlevel for diesel pushers. Wifi only in clubhouse. We came here only for Hershey RV show. Probably never again. They need to allow reservation of specific sites or make all sites big rig friendly before we return. We camped at Hershey RV & Camping Resort in a Motorhome. Walmart and Lowes 20 minutes away. The park grounds are very well maintained, the grass is mowed, the sites are mainly level. The front sites are charged an extra fee even for Elite TT Members. We stayed in section H which seemed to mainly have larger motor homes. The roads inside the park in section H are asphalt paved. The other side of the lake were gravel roads and seemed to be where the families stayed. Friday night was movie night and it looked like a lot of the families enjoyed the movie. Saturday night they had a live band which drew a good crowd. We really enjoyed the park and so far it is one of our favorite TT Parks. We camped at Hershey RV & Camping Resort in a Motorhome. The Hershey Chocolate World is not far away. Stores are within 6 miles along with restaurants. We enjoyed the hometown restaurant in Palmyra. Take a drive to Lancaster and visit the Amish country out door shops. We signed up with Thousand Trails in order to defray some of our camping costs since we are traveling full-time. This was the first TT campground we visited (and why our stay was free.... 30 days are included free in the membership). From what we have heard, this particular campground is one of the nicest ones in their network, and I can believe it. 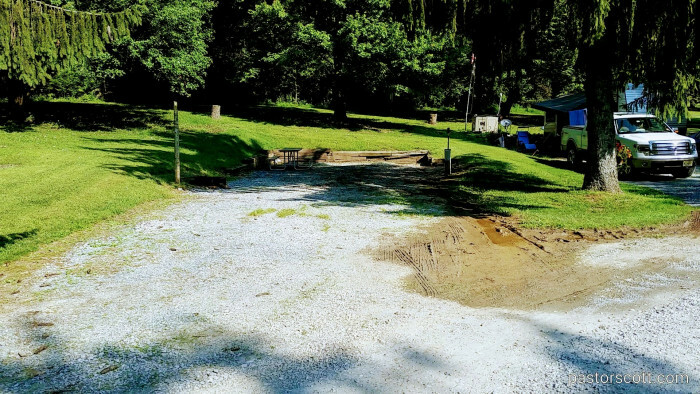 It's very well kept, offers a lot of amenities (pool, tennis courts, mini golf, activities for the kids, etc) and is centrally located, close to all the major Hershey attractions. My only ding is that our spot was very tight. Along with most of the 'big rigs,' we were in the H loop. There are some sites on the inner part of the loop that are quite spacious. The ones on the outer part though, could be very narrow and right next to each other. Luckily, the site we had was long, so our picnic table fit behind our RV, but I would not have put our awning out because it would have come so close to our neighbor's rig. Like other TT campgrounds, you can't reserve a particular site ahead of time, so you just get what's available when you arrive. It worked out ok for us, but we saw someone else completely unable to get their rig into the one available spot. I'm not sure where he ended up going, but I'm sure it was stressful. All in all, we would come back to this park to visit the local sites, and for families looking for a destination campground, I think it would be great. We camped at Hershey RV & Camping Resort in a Motorhome. We are non TT members who were traveling with members, so we paid the non member price. Honestly, I would not have stayed here for that price vs. value. Overall, facility was simply just ok. Roads (between the speed bumps and pot holes) was one of the worst I have experienced in our travels. The speed bumps are ridiculous. Facility is driven towards families with kids....so if your a non-kid traveler, check out someplace else. Wifi worked but so slow, count on your cellular data if internet is important to you. We camped at Hershey RV & Camping Resort in a Motorhome. 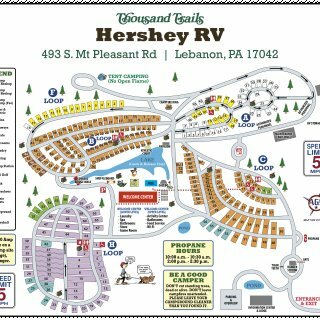 We enjoyed our stay at the Hershey Thousand Trails park - the rate is free for Thousand Trails members / family courtesy card holders for 50 amp sites in loop H.
The roads in the park are in good shape and are reasonably easy to navigate even with a 43' motorhome. The pull-through site that we had in H loop was easy to get in/out of, though the trip up the hill and then the turn into the one-way downhill street was a little hairy. The back-in sites on the outer portion of H loop were not very heavily used - they appeared to be very unlevel. The camp staff was very understanding as we had a personal emergency (trip to ER, emergency surgery, hospital stay) that ended up causing us to have to stay an additional day right at the beginning of the busy 4th of July holiday, but they graced us with an additional night's stay and we were very grateful! We camped at Hershey RV & Camping Resort in a Motorhome. In case anyone else has an emergency while in this area, Penn State Hershey Medical Center is OUTSTANDING! The ER is a trauma center, so it is quite busy, but they provide excellent care, in all areas of the hospital. Town of Hershey is nearby and fun as well as Amish towns and beautiful farms and countryside. Plenty to see and do on Hershey, Pa. There is a chiropractor in Quinten that is so wonderful, and accepts those just passing through without complication! Visit him for a wonderful adjustment for only $30. There is also a great Rails to Trails area there! Hershey park and museum is near by, as is the Amish area. 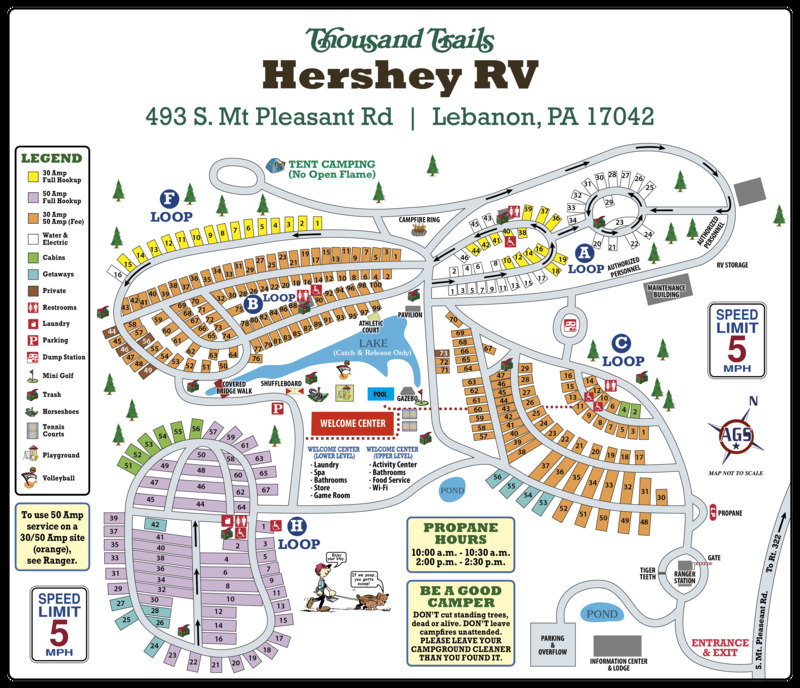 Are you affiliated with Hershey RV & Camping Resort ?